There's still some great work taking place across the University since the last Pulse survey - action-planning is continuing to take shape and responding to staff feedback is an ongoing process. Read about the institutional priorities that have been identified or scroll down to find out more about departmental projects. 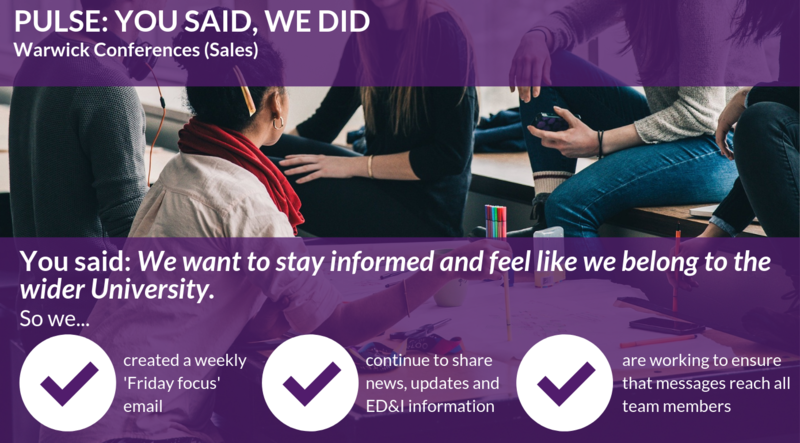 We'll be sharing more departmental updates soon - if your team would like to share a project or a positive post-Pulse story with us, we'd love to hear about them. Email us at pulse at warwick dot ac dot uk and tell us more. For more information about what your department's working on, speak to your local Pulse Champion. 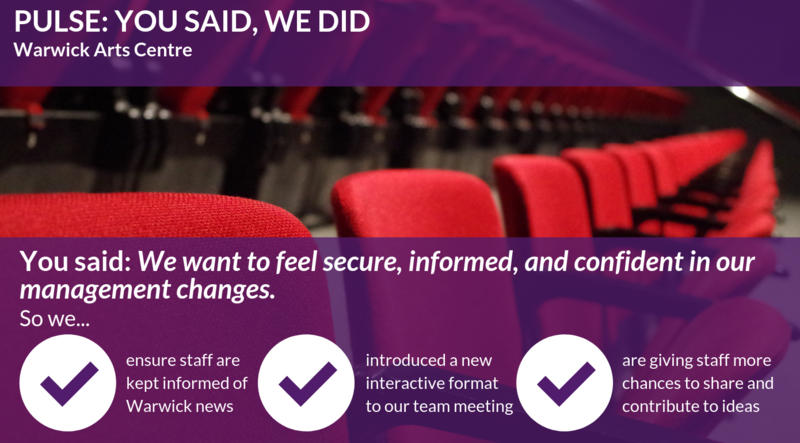 One of the Pulse action plan themes selected by the Arts Centre relates to a feeling of belonging, staff security and confidence in management changes. We are going through some major changes, with a continued extension of the Arts Centre and a new Director appointed in the last six months. In order to keep our staff up to date with developments across the University we have continued with our regular newsletter - we also update internally as and when information comes through regarding Learning & Development courses, all-staff meetings, and campus developments. We've also introduced a new format to our Arts Centre staff meeting, where we spend time discussing departmental updates and actions and then break into small groups discussing how to resolve a particular challenge, before feeding back to the rest of the team. Staff members said they enjoyed this new meeting set-up, as it was 'interesting to understand more about new projects' and 'gave all levels of staff the opportunity to share and contribute to ideas.'" We value the input and feedback we receive from the WMG community, so following the 2017-18 Pulse survey we felt that staff should have the opportunity to have their say more often. In February 2019 we trialled a portable feedback console in four of our main buildings and also introduced an online feedback form. We asked staff to make suggestions to improve life at WMG, report a concern or tell us something else. All suggestions and comments were considered by our Welfare and Communications Group, with staff receiving timely responses and updates on progress made. The online feedback tool has been a great success and will continue to be used going forward. Respect is one of the core values we wish to promote across WMG. 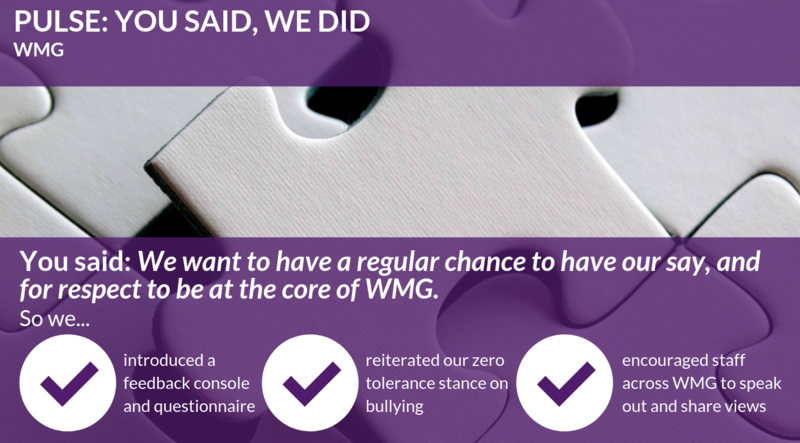 While the results of the last Pulse survey indicated that the vast majority of WMG staff have not experienced any issues around dignity and respect, there was a small but significant minority for whom this was not the case. As a result we launched an internal communications campaign which encouraged staff to think about their own behaviours and speak out if they had concerns. 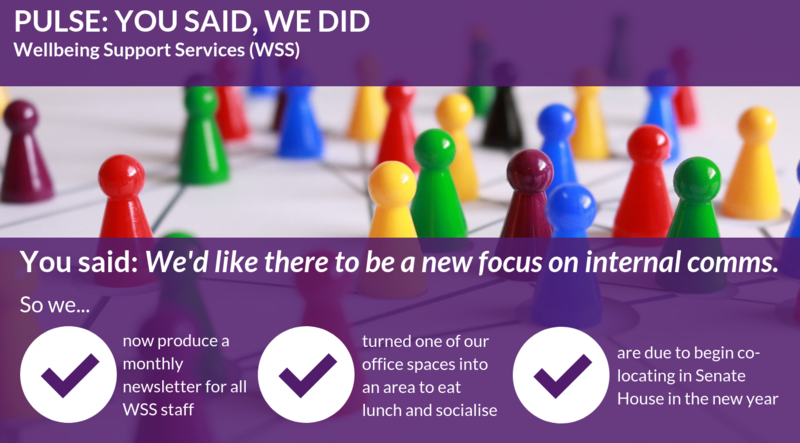 We also identified a WMG contact who can be approached informally to discuss any dignity issues, and signposted staff to university support available." 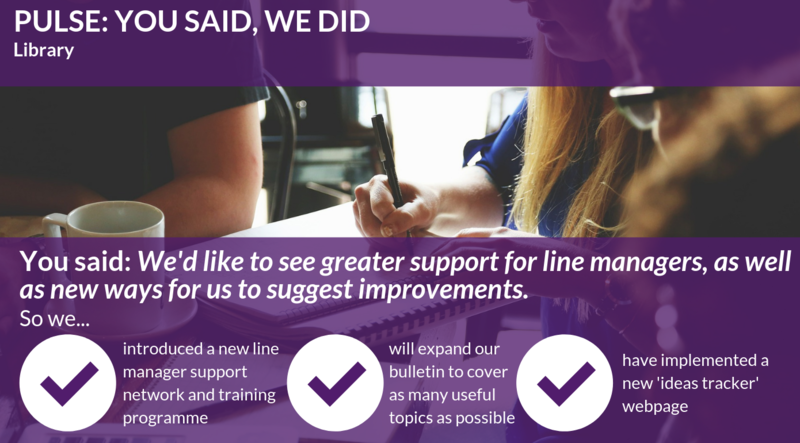 The 2017-18 Pulse survey showed that Library staff wanted greater support for line managers - as a result, we have introduced a new line manager support network and training programme. The training programme is due to run two to three times a year, with the first cohort in June. We are encouraging job shadowing, using the Library staff bulletin to spread the word about this. The bulletin is used as our core communication channel, so we have plans to expand its range of content and ensure we're covering as many useful topics as possible. We have also set up a new 'ideas tracker' webpage, which gives our teams chance to suggest any changes they'd like to see implemented. Other colleagues can then vote on the suggestions that they may wish to see taken forward." Warwick Conferences (Sales) sends a weekly 'Friday Focus' email, which includes news, training, interesting information, ED&I information etc. This was created as part of our Pulse action plan to help our staff to feel 'a sense of belonging to the University'. Our weekly newsletter, which is sent to staff throughout our business, also details articles, links and useful news from campus. ​We are keen to ensure that all of our staff get to know about university events and updates. Some of our teams don't have regular access to a computer, for example - it's important to us that everyone feels part of the wider Warwick community and is kept informed in a way that works for them." Warwick Sport is currently going through a lot of change, with the new sports hub only a few weeks away (15 April). 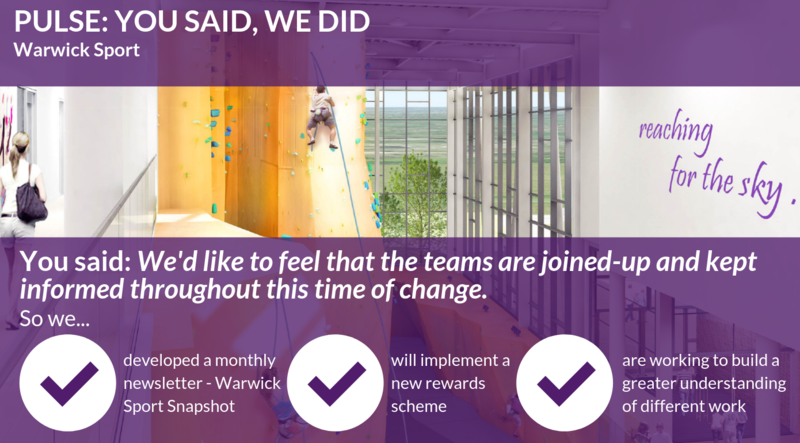 We want to create a real sense of belonging across our teams, as well as an improved level of communication - as a result, we have developed a monthly newsletter, 'Warwick Sport Snapshot', with each team having the opportunity to update on key actions and any new staff. These have been well received by our teams so far and are building a wider understanding of the differing work across Warwick Sport. We have also had a staff vote on a new internal rewards and recognition scheme, which we aim to implement once we are settled in the new hub." HR Wishes was created as a result of the Pulse survey – Human Resources (HR) and Organisational Development (OD) colleagues explained that they’d like to see a focus on social activities, communication, and creating an environment where all ideas were viewed as equal and important. A brand new staff engagement group was launched. June: World Cup sweepstake and predictor competition (and a giant football cake!). 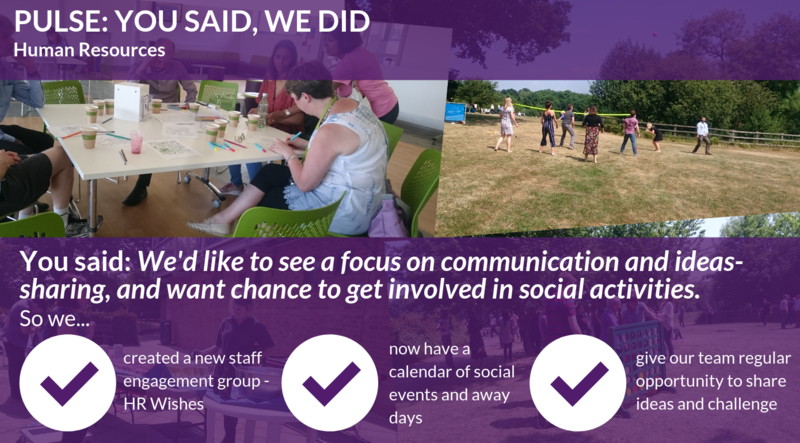 July: People Group wellbeing away day in July – BBQ, mindfulness and relaxation tips, outdoor yoga, Warwick Sport classes. View our summary of the day. October: HR Welly Walk to celebrate #OneBigThing and get active on campus. November: Harvest buffet and food donation drive – thanks to our team, we took seven large boxes of donations to our local food bank. December: Christmas craft fair and lunch, with a focus on thanking our team and celebrating our talents and hard work. February: Chinese New Year celebration. March: Comic Relief cake sale, sweepstake and dress-down day - £200 raised. Ongoing: Answers and solutions to suggestions on a range of topics, from HR’s office environment to staff mental health training; weekly in-person 'HR Huddle'. If you’d like to find out more about any of the events we’ve hosted, please get in touch." In the 2017-18 Pulse survey, our staff told us that they still face issues around collegiality and respect. One of the ways we have tried to tackle this is to emphasise collegiality as a core value in the department - we have introduced a new 'collegiality' component to all of our job advertisements, job specifications and interviews for staff at all levels and in all roles in order to send the message both externally and internally that collegiality and teamwork is a requirement for our department. 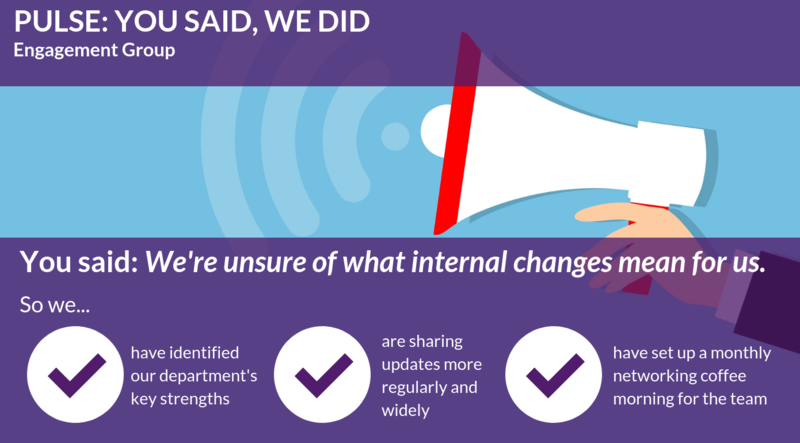 In the 2017-18 Pulse survey our staff told us they wanted to see a focus on improved internal communication. The new Director for Wellbeing and Safeguarding, Dr Hannah Friend, made it a priority in her first few weeks to meet with everyone in the team. Hannah has continued to encourage two-way communication with the team with an ‘open door policy’. Aside from this, we now produce a monthly newsletter to the team, updating on information such as recruitment, staff projects, etc. We have also started using one of our office spaces as a place for the team to eat their lunch - this has helped encourage more socialising. We are due to move to Senate House in the new year which we hope will help improve our communication even more as we will be co-located." In the 2017-18 Pulse survey, staff within our team told us that they wanted the chance to explore further development options to support them with their personal growth or career path. As a result, each team member can now dedicate one hour a month to these key areas. If finding a whole hour is difficult to achieve, this could be split into separate 15-minute sessions each week. We also have a dedicated 15-minute discussion once a month between staff and their line manager to ensure they are supported as necessary." As Administrative Assistants we all have busy schedules and large workloads, so it is all too easy to neglect our personal development. 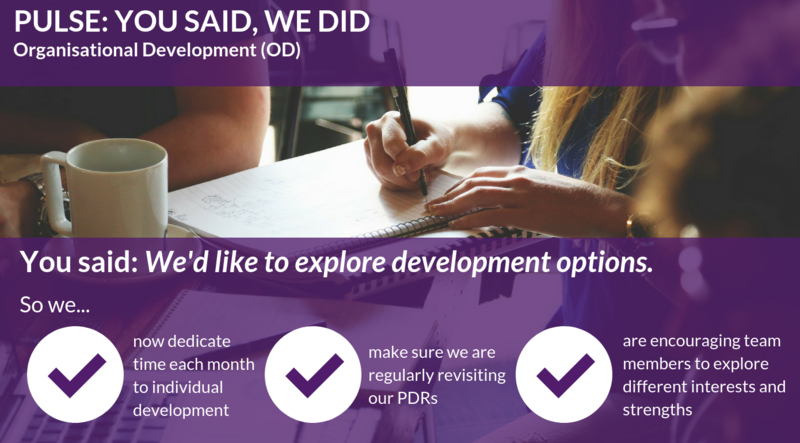 By protecting an hour a month and adding on 15 minutes to each of our monthly catch-up meetings, we have the chance to dedicate some time to our PDRs - thus focusing on something other than our day-to-day tasks. For me personally, it has given me the chance to consider how I can incorporate my interest in mental health into my role." 2017/18 featured a number of significant changes to senior leadership and approaches in the Engagement Group. This was reflected in the 2017/18 Pulse survey results, with colleagues affected by changes expressing anxiety and uncertainty. Before the Pulse survey was launched, the department had already created a framework of internal characteristics as well as identifying our key strengths and how they bring teams in our department together. Tying the Pulse actions and the characteristics framework together will enable us to articulate strategy and support departmental and team planning, sharing updates more regularly and widely across the department. We have set up a monthly coffee morning where the department comes together for a network over a cuppa and a biscuit, followed by presentations and discussions around key strategy development and changes or celebration of successes. Our group is made up of professionals with specialist knowledge in various areas and we are often working as a collaborative; to link individual goals to our strategy and characteristic framework, we will pilot strategic PDR goals to support our staff with their development which we hope will also encourage staff to take a refreshed approach to the PDR and regard this as a useful career development tool."